We round out my romp through Warlords of Draenor goldmaking with the last major transmog profession today. If you have not read any of my earlier posts on WoD goldmaking I suggest checking them out as the basic premises are the same. You can find my posts on inscription, blacksmithing and tailoring. As with the other professions the crafts rely on a bind on pickup material that can only be obtained from daily cooldowns and work orders. The Leather material is called Burnished Leather. The recipes are primarily unlocked by making the daily cooldown item Secrets of Draenor Leatherworking that is used as a currency to purchase the recipes. It will take some time to get all the recipes unlocked so start out today. As usually I will refer you to my post on hexweave bags for the lowdown on setting up a level 3 garrison from scratch. Which items do we want to craft? I sadly don’t have any of the recipes unlocked yet. 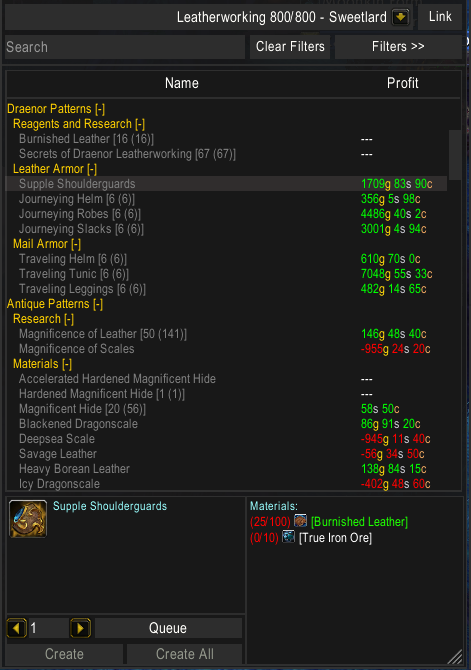 I started setting up my leatherworker today as I have had success in each of the other WoD markets. My TSM setup includes all the crafted armour pieces. This means two sets of epic crafts, and two sets of 3 rare armor pieces. The sets are split evenly between mail and leather. In addition to these crafts we want to make the Burnished essence used to upgrade the items for the 3 possible unique transmogs. We also want to stock the three cloak crafts. As with all the other bind on pickup materials from Warlords of Draenor it takes some work to get the right crafting cost. This caused by two issues. First of all the crafting recipes have yields that depend on your skill level so the basic crafting cost will be wrong. Secondly, there are two main ways you can generate the materials with VASTLY different crafting costs. The daily cooldown craft for Burnished Leather takes 20 Raw beast Hides and 10 Gorgrond Flytraps. As such it is extremely similar to the daily cooldown for Hexweave Cloth. The maximum yield is 20 Burnished Leather per cooldown. To get the correct material price for Burnished Leather we simply set the material cost to crafting/20 as in the screenshot below. The Primal Spirit craft gives you two Burnished Leather. The recipe costs 10 Raw Beast Hides and and one primal spirit. To get the right value for Primal Spirit we will use the same custom price as in my Tailoring post. It’s called minwodmaterial. The import string is below. The price source checks and evaluates to the cheapest of the Warlords of Draenor materials that can be traded for Primal Spirits. Using this together with the market price of Raw Beast Hides we get the material price shown in the screen shot below. My TSM setup is based on my evergreen crafting based auctioning operation. It also includes a crafting operation to restock one of each potential craft. Don’t forget that my Patreon will go live on Wednesday the 2nd of May. That’s next week! I’ll be away this weekend in the Norwegian mountains, so the Sunday update will come on Monday. You can expect a double header on Monday to compensate. why does it say Warlords of Draenor crafting shouldn’t it be legion crafting? I was only taliing about Warlords of Draenor crafting in this post. So unless I added the wrong links or made some other big mistake Warlords of Draenor crafting should be correct.